In today's skin care market, black skin care products are readily available. For skin problems such as acne, black heads, oily skin or dry skin, there are different facial products to remedy these problems. If you have oily skin, the best product to get would be those that contain milk so that it can remove the oil and dirt while keeping the moisture in. If you have dry skin, on the other hand, buy products that contain Shea butter, Aloe Vera or hyaluronic acids. These natural moisturizers will keep your face from getting dry or chapped. For blemishes, use cocoa butter or citrus acid since these are the best for exfoliating. Moreover, when you are choosing black skin care products , pick those that will reduce oil production. If your skin is prone to breakouts, using an astringent after you cleanse it might help in alleviating some of your oil. There are various acne gels that you can use to put on acne spots and blemishes. Although these products may cost a little more, they are well worth the investment. A visit to an Esthetician that specializes in caring for African American skin, at least once a month would also be of great value. Under their care your skin would benefit from deep cleanses and removal of dead skin cells that cause your skin to have that dull, gray, ashy look. When you are in the clinic, be sure to give the Skin Care Therapist a thorough history of your skins background. Also explain your facial regimen and your diet. 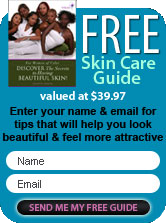 This is important so that the Esthetician can determine what black skin care products to prescribe you. You may need to use a variety of products such as toners, creams and lotions in the beginning to figure out what will work for you. Always keep in mind however that you should monitor the results of your products. Aside from buying all these facial products, the key to having healthy skin is to balance your lifestyle. Exercise and a proper diet should contribute a great deal to your skin's improvement. A good night's rest is also imperative since sleep deprivation causes breakouts. You also have to manage your stress well since this is also a trigger for acne. Taking care of your skin is ultimately a lifestyle choice. You need to be disciplined and put in the time and effort to make your skin better. Do not just rely on the products available in the market. Do your part and you will see good results.